Once awake, I rolled out of bed and began scurrying around my hotel room packing the few remaining items in anticipation of hitting the road again. After the previous day’s GPS debacle, I had taken the time the night before to ensure the proper routes were not only in my GPS, but verified on the cheat sheets I had printed and laminated to be used as a backup. I also entered the day’s destination address in my phone to be used as a last ditch option. Hester was packed and ready to roll, and we did by 4:30. I hit the expressway, rode about four miles and arrived at a toll booth. The toll for my three minute ride was $4.80. I rode another five miles and arrived at another toll booth. This toll was $8.00! I had forked out almost $13.00 in less than ten miles. I remembered where I was, rolled my eyes, and rolled on to; you guessed it…another toll booth. By the time I exited the New Jersey Turnpike, I had paid $31.00 in tolls. One might think that with those prices, the roads would be in decent shape. If one thought that, one would be wrong. Between the potholes and uneven concrete joints that slammed my suspension and damn near rattled my fillings and crowns loose, I thought Hester would literally fall apart. I exited the NJ Turnpike at the Liberty State Park exit. One of my goals for this trip was to get a shot of Hester with Lady Liberty in the background. I knew from my recent work in the City that there was no place in the Manhattan side to get such a shot, so I researched and found that the Liberty State Park road ran parallel to the harbor. I found the closest location and got the shot I wanted. It’s not a great shot of the Statue, but it satiated my odd habit of taking pictures of Hester in historic spots. 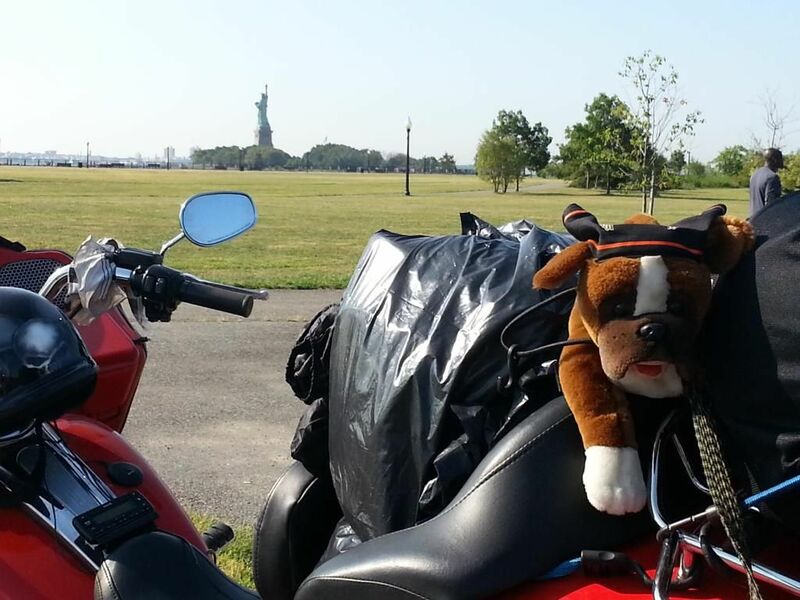 I left the State park with intentions of riding Hester into the Big Apple. 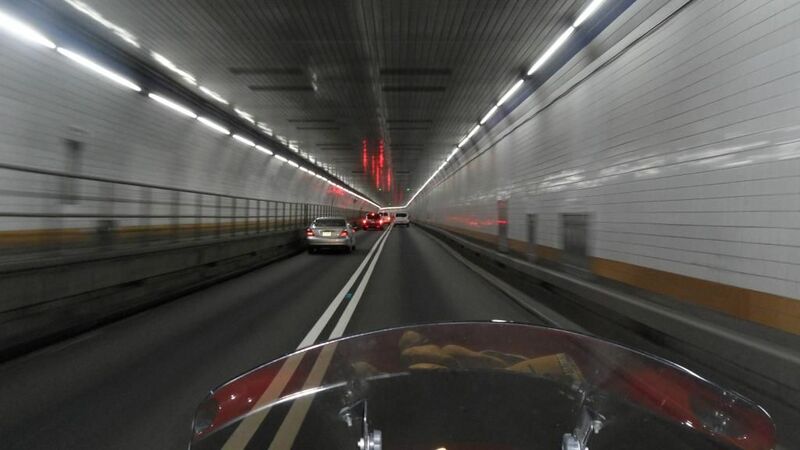 If the $31.00 in tolls I had already paid wasn’t enough, crossing under the Holland Tunnel from New Jersey into Manhattan cost me an additional $14. I suppose I could have avoided most of these fees had I chosen another route. But, I was steadfast in my goal to ride Hester through all the eastern seaboard states. It chapped my hide, but I know when this trip is done, it will have been worth it. One might think that the traffic in New York City wouldn’t be that bad at 9:00am on a Sunday. One would be wrong. I was that one. I picked the Holland tunnel intentionally because I wanted to enter Manhattan at the south end in order to get a shot of Hester at the Brooklyn Bridge. All I wound up getting was a shot of the sign. Another photo goal was in Times Square. 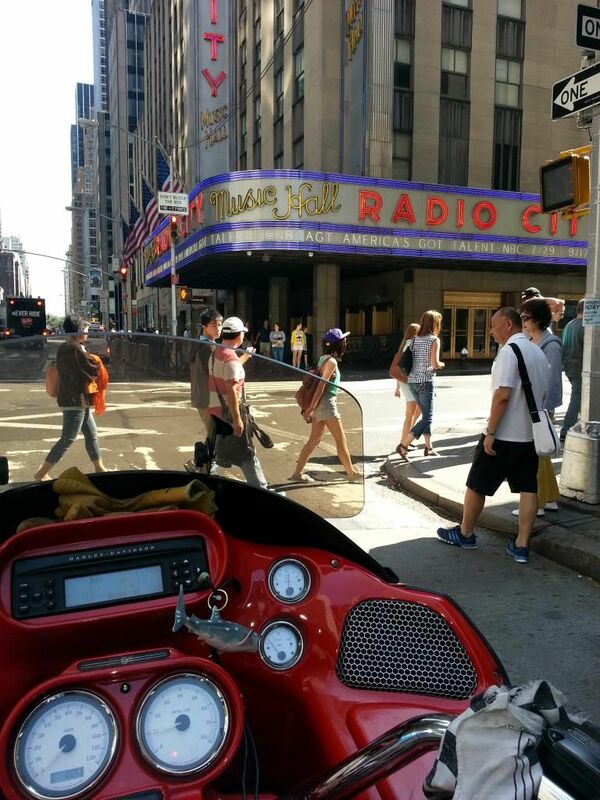 The traffic was so thick and Hester’s air cooled motor was already panting, so I abandoned the Times Square idea and made my way north to the Tiffany & Company where I worked for three months. Those weeks in the Manhattan were the fodder for my Shrug in the City series in this blog. From Tiffany, I headed onto the FDR loop and began to make my way out of the concrete zoo. My next stop was to be 250 miles away in Taunton, Massachusetts where I would stay with an old Air Force friend and former band mate. The continually crappy road surfaces continued until I crossed into Connecticut. At least I paid no more tolls. With no rain, the remainder of this day was pretty uneventful as Hester and I made our way across Connecticut, into Rhode Island, and up into Taunton, Massachusetts, south of Boston. I crossed eight states on this day, which sounds impressive until you remember these were all east coast states. Another goal I had was to pull over and get a shot of each state sign as I entered. Unfortunately, many of these signs are over the middle of the highway instead of on the right side of the road. After a short 500 mile riding day, I arrived at Andy’s place at 3:00 in the afternoon. Andy and his parents were celebrating his daughter’s 17th birthday and were having a BBQ party. I hadn’t seen Andy’s folks in almost 20 years. They were as gracious and genuine as they were the first time we met. Andy’s father is Scottish and his mother is from Finland and despite their forty plus years in the States, they both retained the thick accents of their homelands. After overeating, Andy and I had the chance to play some music. 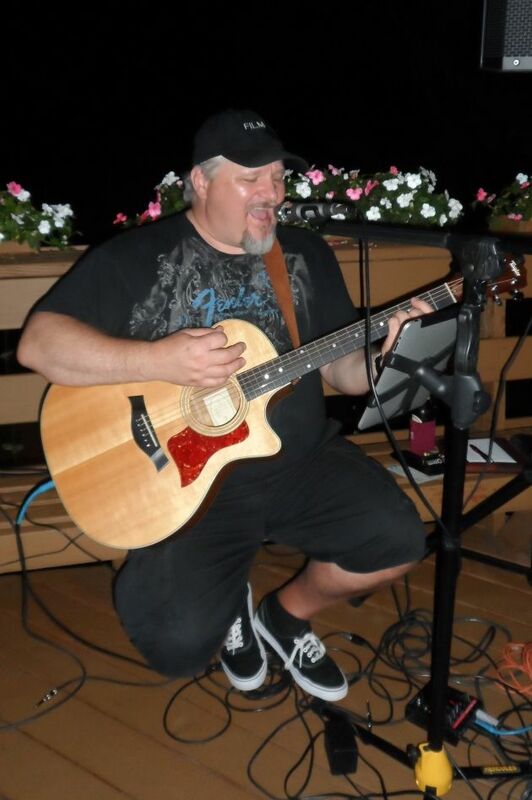 Andy is a true guitar virtuoso and a damn good vocalist who plays a variety of musical styles in several bands. Fortunately for me, we stuck to 70’s and 80’s tunes that I actually knew. Overall, it was a great day on the bike. No rain, eight states, reconnected with a great friend and his sweet parents, played some music, and to top it all off, slept in a bed that wasn’t in a hotel. I hit the sheets around 10:00pm and was asleep before I could even begin to assemble the sheep to count.